Goplus Folding Sit Up AB Bench Fly Press Gym Adjustable Incline Flat Weight Bench by Goplus at Strongman Pictures. MPN: SU-34823-PS. Hurry! Limited time offer. Offer valid only while supplies last. DescriptionThis is our new incline sit up bench, which makes work more effective, as well as adds strength and tone to the entire abdominal section. This is our new incline sit up bench, which makes work more effective, as well as adds strength and tone to the entire abdominal section. With ample padding and heavy duty steel construction, our sit up board provides stability for simple exercises and is ideal for you to more easily emphasize lower abdominal muscles and build the abs you want in less time. Welcome! High quality with competitive price can be realized here! 【440 lbs Weight Capacity】It was made of heavy duty steel. The max loading weight capacity is 440 lbs. It provides stability and safety for your exercise. 【Comfortable Design】Its ample padding on the bench can support your body and eliminate back strain. It makes you comfortable when exercise. 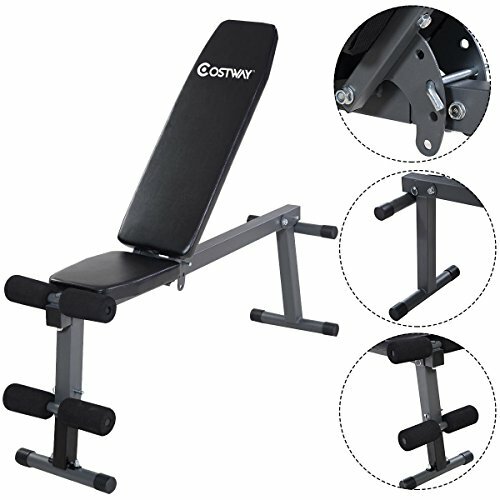 【Adjustable height】This abs bench offers 3 levels of height to ensure you get the right abdominal workout. 【Easy to Assemble and Fold】Clear and brief instruction make it much easier to assemble. And it can be folded up when you don't use it. It is not only suitable for gym, but it also can be used at home and office. 【Effective Trainer】This multifunctional machine can exercise your abs and legs. It performs excellently for sit ups, twists and more. It will be a good trainer for you to exercise effectively within a short time.